This beautiful Chinese Mah Jong set is perfect for beginners. The set includes 144 polystone resin white tiles all stored within a durable black vinyl case that snaps shut to keep your game pieces secure. The set measures 9" x 6 1/4" x 2". This wonderful mah jongg game set provides enless hours of fun for you or your entire family at a very affordable price. This fabulous Mahjong set is covered in a dark brown alligator skin vinyl coupled with a contrasting red interior. This travel case includes all your game accessories. The set features 166 polystone resin tiles, with four trays racks, money holders, four colored trays, chips, dice, bettor and instruction booklet. A perfect set for beginners or experts for an incredible price. Join the excitement with this new variation on the classic Chinese game of Mah Jong. Rum Jong is a fast and exciting game that can be played between 2 to 6 players and appeals to all ages. Players try to build sets of matching tiles using the 124 carved tiles of different suits and symbols. This great looking Chinese style jumbo tile Mahjongg set features a durable vinyl snap close case. The set has a convenient carrying handle, 144 durable Polystone resin jumbo white & green tiles plus two blanks, dice bettor and instruction booklet. This Mah Jong set for sale will provide endless hours of fun play for the entire family at a very affordable price. This stunning set is perfect for the mah jong enthusiast! This set includes 166 tiles, trays, chips, dice, bettor and instruction booklet all set into a burgundy cloth bag with carrying handle. 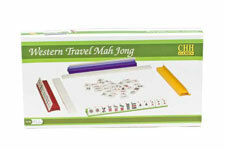 This exceptional Western Mah Jong set has a modern, business like look. It has a strong and durable hard shell plastic executive style carrying case with a carrying handle and locking hardware. The interior of the set is covered in elegant black velour and contains 4 colored fluorescent plastic racks, 166 tiles, trays, chips, dice, bettor, instruction booklet & locking key. This set is great for traveling and ensures endless hours of playing fun for the entire family at a very affordable price. All color options for this Mah Jong attache case are shown below. MJ005-2400BLK. Deluxe Black Leatherette Western Mah Jongg Set. Perfect for beginners and advanced players alike, our Western Mah Jongg set features a strong & durable black leatherette executive style carrying case with a carrying handle and locking hardware. The interior of the set is covered in elegant black velour and contains four colored fluorescent plastic racks, tiles, trays, chips, dice, and bettor. Excellent item for sale at a great price. The imitation Alligator skin Leatherette gives this deluxe Mah Jong set an opulent look. This remarkable set includes an attaché case with Brass clasps; a rich looking black felted interior finish and a sturdy carrying handle. Inside the case, you'll find 166 Polystone resin Tiles, four transparent colored racks with money holders, tile trays, chips, dice, bettor and instruction booklet. This distinctive looking Mah Jong set comes in a vinyl attaché case covered with an antique-looking map of the old world. It features Brass hardware and a sturdy carrying handle. The inside has a rich burgundy felt lining. This eye-catching set includes 166 Polystone resin Tiles, four transparent colored racks with money holders, tile trays, chips, dice, bettor and instruction booklet.